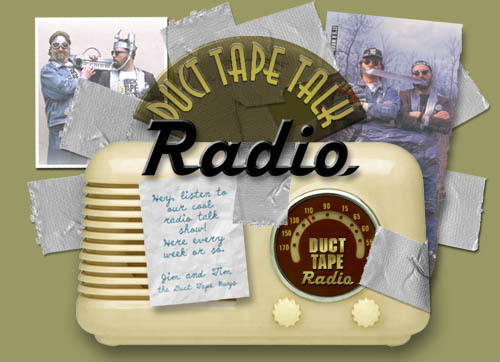 Back in 1995 when Jim and Tim were just starting out as the Duct Tape Guys (actually, you will hear that they called themselves, The Duct Tape Dudes), they recorded 15 radio shows for stations around the country to use as a promotion for their then new book, The Duct Tape Book. Now, four books, six Page-A-Day Calendars, and thousands of radio and television appearances later, The Duct Tape Guys are still at it as "Duct Tape Evangelists" sharing the "Gospel of Duct Tape." Take a listen to their 2.5 minute shows. They will update the show weekly. Then, click the ticket stub on the left to see the guys today (in their Mega Mini Movies).